Cherry pie filling is one of my all time favorite pie fillings. And Lucky Leaf’s is bursting with big and delicious cherries inside. You can truly see a difference in their pie filling. So when choosing a dessert to make, I knew that I wanted to use it. So then it came to me. Why don’t I combine three of my favorite desserts in one!? 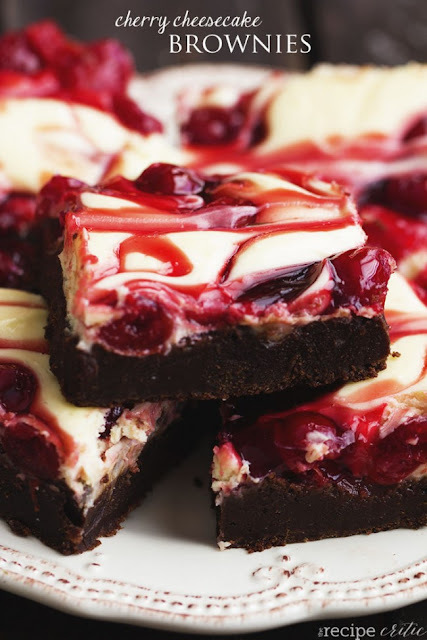 And that my friend, is how the Cherry Cheesecake Brownie was born! This dessert turned out way better than expected. I could hardly wait for them to cool and set. My cherry loving 7 year old kept sneaking cherries from the top. Apparently, he couldn’t wait either! Heat oven to 350 degrees. Line a 13x9 inch pan with foil and spray lightly with cooking spray. Set aside. To make the topping: Beat together cream cheese, and sugar until smooth. Add in egg and vanilla and continue to beat until smooth. To make the brownies: In a microwave-safe bowl, melt butter and chocolate 30 seconds at a time until melted and smooth. Stir in sugar vanilla and salt. Add in eggs and flour. Mix until incorporated. Spread brownie mix into the bottom of your 13x9 inch prepared pan. Drop Cheesecake mixture on top followed by the Lucky Leaf Cherry Pie filling. Run a knife through the top giving it the marbled look. Bake for 45-50 minutes until the cheesecake states to turn lightly brown on the edges. The cheesecake center will still jiggle a bit. Cool completely and chill for 4 hours before cutting. You can also find this recipe in Lucky Leaf's FREE ebook with 20 delicious recipes inside! 0 Response to "CHERRY CHEESECAKE BROWNIES"